We look at the attributes for a point in a drawing layer and edit one of the attributes using a more expanded Edit dialog. We then move the point to a new location. Easy! This example has been published as the Manifold Future - Future Tour Part 4 Edit Attributes, Move a Point video on the Manifold Sales YouTube channel. We will make an addition and a correction to the database of Neolithic sites used in the Select and Transform a Neolithic Relics Database video. 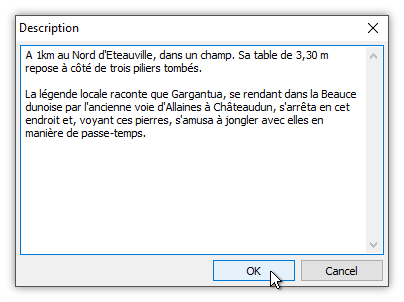 Specifically, we will expand the text commentary that is in one of the attribute fields for a dolmen, a type of stone construction from Neolithic times that is found in many parts of France. The image above shows a typical Neolithic dolmen, with a table rock (the flat upper rock) being not quite two meters (six feet) across. A dolmen usually has a flat table rock placed upon three or more upright flat stones to create a small stone room or chamber. Dolmens apparently were originally covered with a mound of earth, like an artificial hill, so that what we see today would have been the stone construction that created a chamber within the hill. Today, almost all dolmens have had their covering hills eroded away. Most were erected from 4000 to 6000 years ago. Hundreds can be found in France. 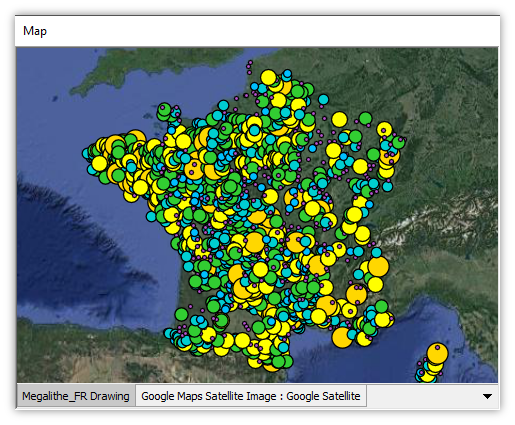 The map above shows hundreds of points, styled by color and size to indicate different sites and different types of Neolithic monuments in France. 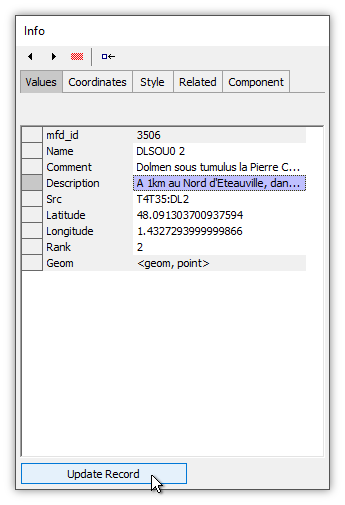 We have clicked on the Megalithe_FR Drawing layer, which contains the displayed objects, to make it the active layer. 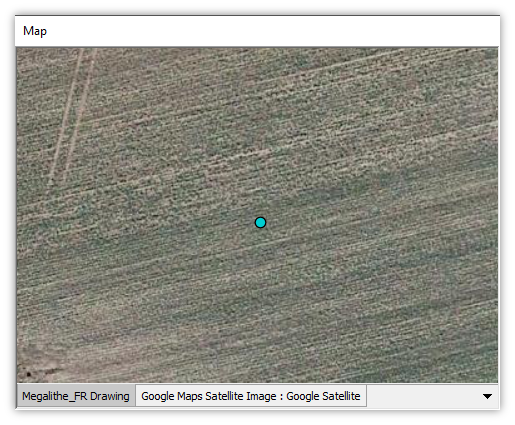 Zooming far into the drawing we see what appears to be the wrong location, marked by a cyan dot, for a dolmen. To the right is a wooded area and slightly lower to the left is what appears to be the true location of the dolmen. Zoomed further in, the Google satellite layer we have added to the map shows nothing but an empty farmer's field at the dot. In the field nearby we see what at even higher zoom level seems to be a larger-than-average dolmen, surrounded by a cleared area. In the past, especially after the invention of dynamite, farmers annoyed with multi-ton stone constructions blocking their plowing would often blow up and remove dolmens from their fields. 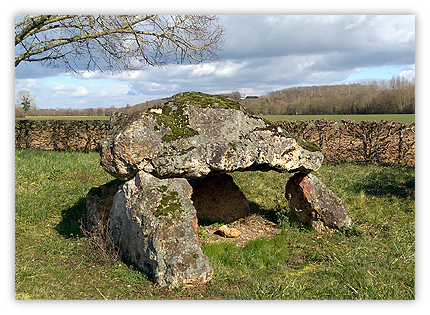 In modern times, dolmens in France are often protected in wooded areas, small parks, or clearings within farmed fields. We will begin by seeing the attributes, that is, the field values for this object. To do that we check that the layer containing the dot is the active layer and then we alt-click the magenta dot. That immediately marks the dot with blue preview color as our chosen object, and it also opens the Record panel of the Contents pane. The Record panel automatically opens to the Values tab to show field values (also known as attributes in GIS jargon) for the alt-clicked point. Since this is a French database the information is in French. to see the full text of the Description field we can right-click on it. 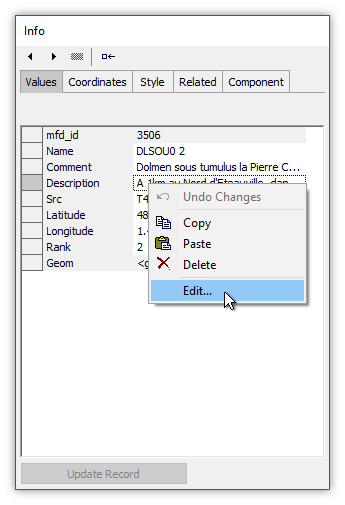 We choose Edit from the resulting context menu. That launches a larger editing dialog that shows the full text in that field. We can se that the table rock is 3.3 meters in size, over ten feet, which makes this dolmen a larger than average dolmen, but that the dolmen has collapsed with the table rock lying next to the fallen vertical rocks. The dialog allows us to make edits to the text, such as adding additional text. We add additional text to further describe the dolmen found in that location. We press OK.
A 1km au Nord d'Eteauville, dans un champ. 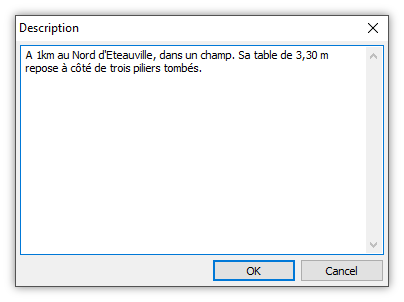 Sa table de 3,30 m repose à côté de trois piliers tombés. The full text for the record, for those who do not read French but who would like to give an online translator a try, is given above. C'est bon! The edited field is indicated in blue preview color. We can abandon the edit with a ctrl-backspace, if desired. To accept the edit, we press the Update Record button. 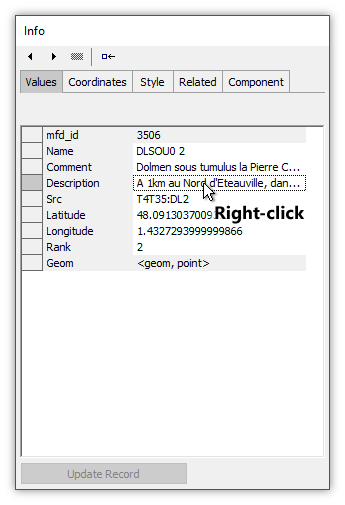 The point is still marked in the map window with a blue dot to indicate it is the chosen object for which attributes are displayed in the Values tab. However, it cannot be moved in the map window. To enable the point for editing we click on the Coordinates tab. That displays the values of the coordinates for the location of the point. If the chosen object had been a line or area we would see a list of coordinates for the list of vertices that defined the shape of the line or the area. 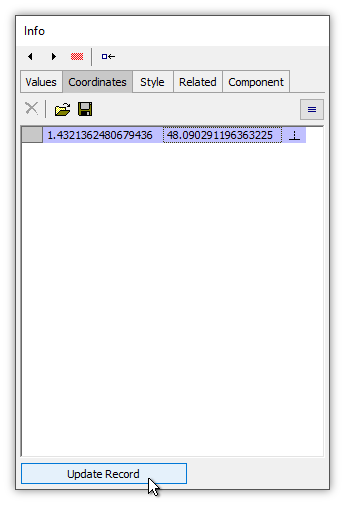 In addition to displaying coordinates for the point, when we click on the Coordinates tab that also enables the object for editing in the map window. The small blue marker expands to a larger blue square to indicate the point is available for editing. 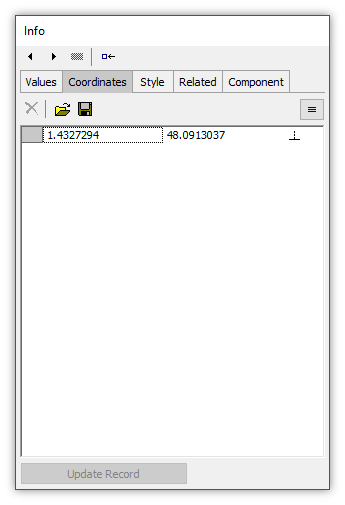 Having to choose the Coordinates tab is a safety measure so we can alt-click on an object to see its attributes without immediately enabling the object for editing as well. To move it to a new location we can simply click and drag it to whatever location desired. 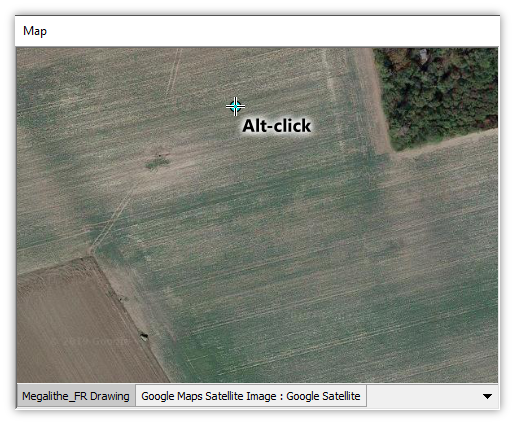 In the above illustration we click and drag the point from the wrong location to the true location of the dolmen in the field. When we do that the coordinate values in the Coordinates tab change to the new location and are displayed in blue preview color. To abandon the edit we could press Ctrl-backspace and the point would pop back into its original position. To accept the edit we press the Update Record button. When we press the Update Record button the edit is committed and the Record panel snaps back to the Values tab. In the map window, since we are now back in the Values tab the object is no longer enabled for geometry editing and is marked with a small blue marker. To eliminate that, that is, to not choose any object for display in the Record panel, we can alt-click anywhere in the drawing away from the object. In the view above we have zoomed further into the display so we can more clearly see how we dragged the point exactly onto the dolmen. We can see the cyan dot marking the location of that particular dolmen has been moved from the wrong location, out in a field where no dolmen is located, to the correct location, immediately on top of the actual location of the dolmen in the field Now would be a good time to save the project.